Each Past & Present map is centred on a city or town and covers an area of 15km x 15km using four Ordnance Survey mapping series to cover four different periods: the mid 19th century, the late 19th century, the1920s and the present-day. All four maps cover exactly the same area. To achieve this, the three historical maps have been enlarged from their original inch-to-the-mile to match the 1:50,000 scale of the present-day one. The addition of the familiar National Grid on all four maps enables easy comparison across the four time periods. Historical notes, details of the original maps used and web-links for local history societies and other sources of information are also provided. All in all, comparing the past with the present has never been easier! Easy comparison of past and present. 4 periods, 4 maps, 1 scale.Ordnance survey One-Inch maps from the Old series, New Revised Series and Popular Edition enlarged, re-projected and shown alongside present day 1:50,000 mapping. Worcestershire Sheet 8.15 Kidderminster 1921 - published 1996; introduction by John Boynton This detailed map covers most of the town of ..
Worcestershire Sheet 14.10 Stourport 1901 - published 2002; introduction by Barrie Trinder This detailed map of Stourport is double-sided..
One Inch Sheet 182 Wyre Forest, Droitwich & Kidderminster 1907 - published 2002; introduction by John Boynton This One Inch to the Mi..
A transcription of the surviving death registers for the Kidderminster Union for the years 1866 to 1884 and 1895 to 1913. The Kidderminster Poor..
Transcript & Surname index 1851 census Worcestershire Volume 2 Kidderminster Public Record office Ref: HO 107/2037 In Boo..
Census Transcripts on Microfiche Kidderminster 1851 Census; Transcript and Surname Index; Part 1 Please note: Microfich..
Census Transcripts on Microfiche Kidderminster 1851 Census; Transcript and Surname Index; Part 2 Please note: Microfich..
Monumental Inscriptions Stourport -On-Severn, St. Michael & All Angels (Lower Mitton) There are 2 downloadable pdf files (approx. 4.9MB, ..
Kidderminster St.Mary and All Saints Monumental Inscriptions This is a downloadable pdf file (approx. 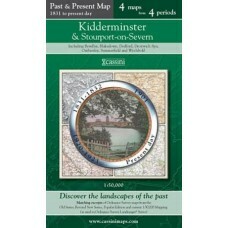 9.3MB, 90 pages) First Edition 199..
Kidderminster and Stourport on Severn Cassini Map - Past and Present series - 4 maps from 4 periods 1:50,000 Special stock clearance pri..